The more I do video production with my Nikon D4 DSLR, the more I have come to like how it handles in-camera audio with an external mic attached. One of the big issues with the first generation video-enabled cameras like the Canon 5D Mark II and the Nikon D3s was they had limited audio capabilities. Many producers felt the need to record separate audio into a recorder like a Zoom H4n and then sync it later in post. What a pain. It’s one of the reasons I put off switching from a traditional video camera to a DSLR. With my Nikon D3s, I went the route of trying to use a JuicedLink audio interface to manage my audio. The unit bolted on to the base of my camera, which made it feel bulky. It had great features like dual XLR audio inputs, levels monitoring and a headphone jack, but the truth is, on that piece of equipment, I could never dial in a clean audio signal. A big part of the problem was the way the D3s handled audio with only three levels settings—high, medium and low. The last time I used the camera with the JuicedLink, I had such a high noise floor (a low background hiss) in my interview audio that I just left it on the shelf after that. Soon after, I upgraded to the Nikon D4 and have found I could generate low-noise audio, especially with a wireless mic, all without all the add-on accessories. I like using a DSLR to shoot formal interviews. The shallow depth-of-field makes the subject look great. 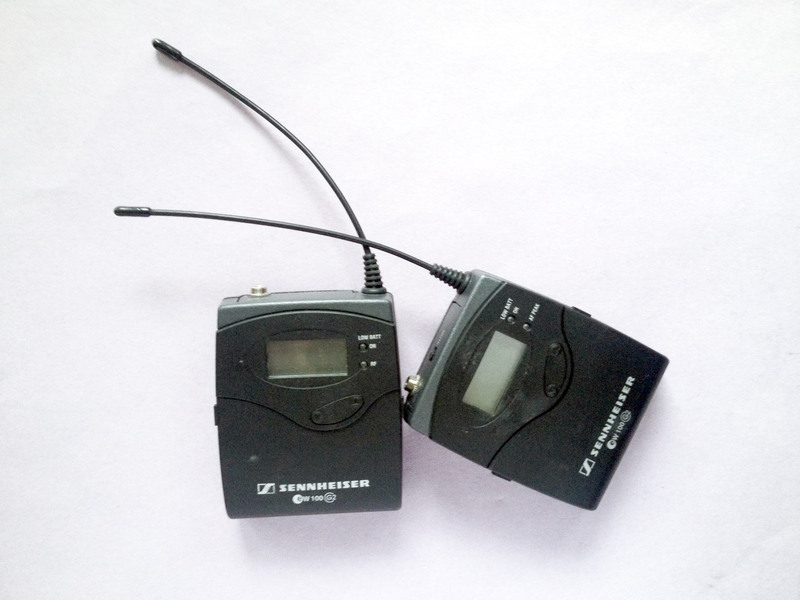 I use my trusted Sennheiser G2 wireless mic for my audio. Be advised, out of the box the gain on these mics are set really high. The first time used it, I had such distorted audio that it ruined the video story I produced for the newspaper. I quickly learned how to turn down the levels and make them work with my Sony Z1u video camera. When I first used a wireless mic with My Nikon D4 (plugged directly into the camera’s mic jack,) I found the same high noise floor that my JuicedLink produced. After fooling around with the settings I came to this conclusion: I had to turn the levels on the mic back up and turn the camera audio levels way down. With the right balance (the mic sending the clean signal, which I assume overpowers the camera’s weak pre-amps), I now get quality audio without a lot noise-floor hiss. Is my camera audio as good as recording separately to a Zoom H4n? I’d say depends on what you are doing with the video. If its going to be broadcast on TV, or destined for the big screen, then maybe not. But, if you are producing for the Web like I am, I’d say it’s more than good enough. On my Nikon D4 (the same as on the Nikon D800,) I set the camera on manual and dialed the camera audio down to number 4 level. On the Sennheiser receiver pack (the one that connects to the camera) hit the “Set” button then toggle the left selection button until you get to “AF Out.” Hit “Set” again and toggle the left arrow until you see -12 Db. Hit “Set” again. Next on the transmitter pack (the one connected to the lav mic) hit “Set” then toggle to “Sensit” and hit “Set” again. Toggle until you get -06 Db. Hit “Set” again. Now do a test. Watch your in-camera levels. If they are too low, bump up your audio level to “5,” but no more. If they are still too low go back into the mic pack and set the AF Out level to -6 Db. Just remember that there is no phantom power with DSLRs. You need battery power from the mic for it to work properly. I sometimes put my big Sennheiser ME-60 shotgun mic on top of camera and it works like a charm with very low noise. Just make sure you have a fresh battery in mic and that it is turned on. If you don’t, you won’t record any audio.